Deep in the heart of Appalachia lies a small Southern Baptist church named Caney Baptist Church. A faithful group of local residents met regularly for a period of years in the 1950s in one home or another to worship the Lord and pray for and serve their community. In answer to their prayers, the building blocks of a little mountain church came together. One family donated a plot of hillside while others brought cement blocks, lumber, and nails. Labor and determination culminated in 1960 when a new church for Pippa Passes, Kentucky, was constituted. The church was founded as a mission of First Baptist Church of Mousie, Kentucky, and the Reverend Floyd Titsworth, Jr. was the first pastor. Caney Baptist Church has grown in membership and is proud to be the home of a diverse mix of people from all socio-economic and educational levels. Sunday morning church services, vacation Bible schools for children, a food pantry for the needy, and an outreach post accepting and distributing food, clothing, and housing assistance for local, needy people barely touches the surface of Caney Baptist Church's many forms of service. Read the full history here. From it's founding in 1960, Caney Baptist Church as served the community of Pippa Passes, providing spiritual nourishment, food for the hungry, clothing for the needy, and assistance with housing and home repairs. We are a doorway to mission groups from other states who come into the Eastern Kentucky region to assist and uplift the Appalachian people, and we support missions through donations and the sending of missionaries into our region and the whole world. Since 1964, the second and current pastor, Reverend Lawrence Baldridge, has served at Caney Baptist Church. Reverend Baldridge and his wife, Martha, have lived, worked, and raised their family of three children in the Pippa Passes community. The Church has been fortunate to have ample volunteers serving as deacons, Sunday School teachers, youth group leaders, bus drivers, music leaders, and food pantry coordinators. When a need arises, prayer and the Lord's calling leads able church members to volunteer. Pippa Passes is a small community in the Appalachian hills of Eastern Kentucky. There is a small private college, Alice Lloyd College, which provides a significant portion of the population with its 600 students and 100 faculty and staff, who for the most part, live on campus. The other community residents vary widely in education and income levels. Members of Caney Baptist Church are public school teachers, small business owners, self-employed service providers such as a dentist, a plumber, carpenters, accountants, medical personnel, Alice Lloyd College employees and students, and under-educated people -- especially children -- from mountain hollows such as Onion Blade, Hollybush, Hempatch, Trace, Short Fork, etc. 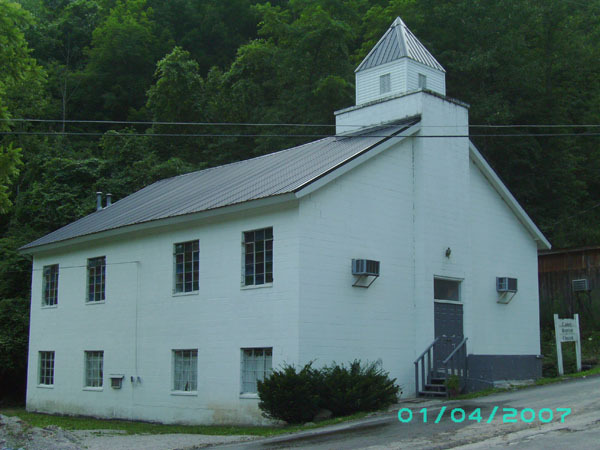 Caney Baptist Church was once in the hub of the Pippa Passes community, sitting at the foot of Caney Mountain and the mouth of Spruce Pine Hollow. Since its establishment, the community has grown and expanded in all directions, leaving the original Church at the end of Alice Lloyd College's campus rather than in the midst of the Pippa Passes community. In the 1980s, Caney Baptist Church members made a decision to work toward relocating the Church onto Kentucky State Highway 899, the main road through Pippa Passes. Property was purchased, and a new church building was planned. On April 1, 2007, the ground-breaking ceremony for the new church building was held. Construction began in June 2008. A group of volunteer construction workers, the Carpenters for Christ, selected Caney. A 9,000+ square-foot church now stands on the property on Highway 899. The 180-seat sanctuary is the centermost part of the Church. The Sunday School wing house 9 classrooms for Nursery, Preschool, 1-2 Graders, 3-4 Graders, 5-6 Graders, Teens, College, Adult Men, Adult Women. The Fellowship Hall wing consists of a kitchen, food pantry, and reception area. The Church is handicapped-accessible.